I love this idea to try on our favorite JCPenney Chinese Chippendale stool. 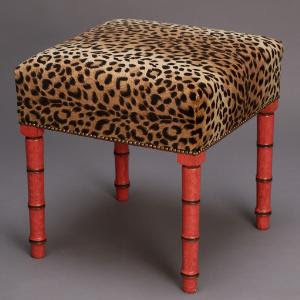 Paint the base in coral, orange, or cinnabar and cover the cushion in leopard. Too fabulous! A++, Beth this looks fabulous. I'll take 2. Oh, that is absolutely fabulous!! I love coral with anything, it's one of my favorite colors! That leopard fabric is perfect! Leopard AND chinoiserie! Be still my heart!!! Vickie-You might have to try this!